Hello fellow ICers! Welcome back to my blog! If it's your first time here, make sure to look through all of my posts for helpful information about diet, treatment, medications and other tips for coping and living with IC. Today what I would like to talk about is my struggle with IC + IBS and how mint tea saved my life. I suffered from IBS-C (constipation) for most of my life. I was officially diagnosed when I was in high school and after that I was able to manage it with diet, exercise and digestive enzymes. Things got more complicated after I got IC but I was still for the most part able to manage it. A couple of years ago, for the first time ever after a virus and a two week stay in the hospital, everything changed and I was re-diagnosed with IBS-D (diarrhea). No matter what I did, no matter what I ate, it led to unbearable diarrhea that lasted for about a year. I lost about 35 lbs, was completely bedridden and miserable and got to a point where my will to live was fading quickly. I was constantly losing dangerous amounts of electrolytes, especially potassium (which ICers are generally low on because they are sensitive to it), and I was having to take compounded potassium and eat painful things in order to survive. I had loperamide (Imodium) compounded so it didn't cause an IC flare and found myself taking it constantly. One day was particularly bad and I had taken a lot. My ears started ringing along with a bunch of other startling symptoms so I looked up the maximum dose and counted how many I had taken. It was way over the maximum. I called poison control and they called me an ambulance. Yes, I had accidentally overdosed out of my desperation to stop the diarrhea. During this time, because of how skinny I had gotten (not 'good' skinny --> scary looking sick skinny), I couldn't even take my regular pain relief medications because it would suppress my breathing too much and even some of my doses had to be lowered because of that hazard. As if that wasn't enough, my surgeon who implanted my Interstim was threatening to remove it entirely because every part of it was sticking out of my body and pushing and grinding against my tailbone. He demanded I gain weight and gave me a short timeline saying he would remove it if I didn't gain at least 15 lbs. I had been trying to gain weight but every attempt left me crying in the bathroom with horrible diarrhea; it was worse now since every time I had taken even one loperamide after the overdose I would get dizzy so I got scared and cut them out entirely. I was well versed on everything concerning IBS-C but I was admittedly ignorant when it came to IBS-D so I started doing research. When my research produced "peppermint tea" as something that not only helped IBS but also was "generally okay" for ICers, I mustered my bravery and tested it. Even though it was organic, even though it was one ingredient and I had taken a lot of Prelief, it hurt. BUT it helped stop the diarrhea. So, I started drinking it - I would only leave it in hot water for one minute so it was very weak and wouldn't hurt as much but would still help. I went on like this for several months. When something I was eating that was high calorie would set off the diarrhea, instead of taking a bunch of loperamide, I would be guzzling several giant mugs worth of mint tea. I had to accept that this was my fate and if I wanted to live that it would be in this heightened state of pain from drinking the mint tea. I figured that it had to be some kind of a fluke and like the somewhat stubborn person I am, the next day I didn't take the teabag out after that one minute mark. I let the it soak longer than I ever had. When I tasted how strong it was I started to think I was a psycho for even putting myself at risk for the kind of pain I was inevitable to feel in the minutes following. I held on waiting for that ocean of pain to overwhelm me. Nothing. How could this be? It honestly took me until several boxes later to accept that this kind was just different and that it would never hurt me, no matter how strong it was. Even though at first I was extremely skeptical and suspicious, now I see it for what it is/was: my saviour. 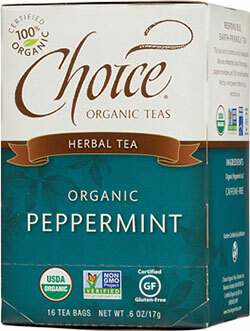 I was able to eat now without ANY diarrhea, so long as I always drank Choice Organic Peppermint Tea. It is years later and I still drink several cups of this amazing brand of mint tea every single day. I have had to make some adjustments to my diet, of course, to accommodate for the new diagnosis and if I don't have mint tea with what I'm eating (regardless of what it is) I will get diarrhea again but I haven't had to take ANY loperamide in years - nor would I! This mint tea works better than ANY amount of Imodium EVER did. And it doesn't add any chemicals or potentially dangerous medical ingredients to your system! It saved my life. I was able to gain back my weight so I could take my pain medications again, digest and absorb the nutrients in my food, keep my Interstim implant and not live in the bathroom and just in bed. I can leave the house now and when I'm going to be out for a long time, I just bring some mint tea with me! I hope that those of you who try this brand are like me and have ZERO pain (even with an empty stomach, even with drinking nothing else, even with no Prelief or other aid). I don't want to tarnish another brand so I'm not mentioning which one was causing me pain, but if you haven't tried this and haven't had success with mint tea, I encourage you to try it and please report your results! Living with IC + IBS can be difficult, but if I can figure it out, I promise you, so can you. does lope worsen IC flares? I get it compounded from a local pharmacy so it only has 3 ingredients. The new brand name Imodium has a bunch of extra ingredients, so if I were to use that, it would flare me, but my compounded one luckily doesn't irritate me.